Day two at Disneyland. Because we hit the park hard yesterday we felt it in our legs today. That didn’t hamper our spirits though and we strolled over to the park after a couple of continental breakfast pastries. I was thinking about an early morning dip in the hotel pool but it doesn’t open until 9am pretty much guaranteeing any serious ride goer like myself won’t be taking advantage of their facilities. 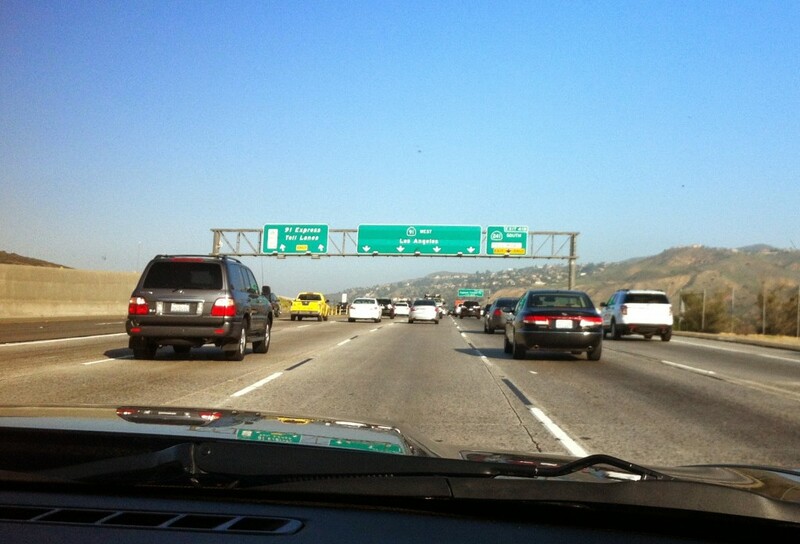 On our third day in California, we rose bright and early to hit the road pretty much exactly when the rest of Calfornia was on their way to work. 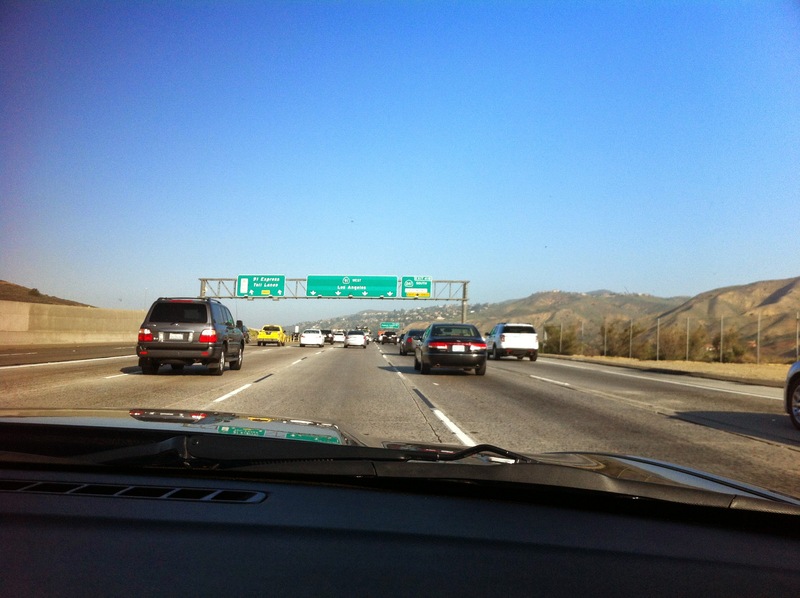 While I knew that it was going to be a driving adventure, navigating that many lanes (at times as many as 8 going our direction) was something I hadn’t totally expected. Luckily we arrived without incident. Once in the park, the secret to getting the biggest return on investment is knowing which rides are worth waiting in line and which are better to get a Fastpass. The newish Radiator Springs Racers Cars is a very popular attraction, so first things first, we found the Fastpass station and got hooked up! The thing about Fastpasses is that you’re only supposed to be able to get one at a time, however, we raced over to the line for Fastpasses to the World of Color because I had read that it isn’t on the same system as the other Fastpasses and, just like that, we were already working the park like pros! 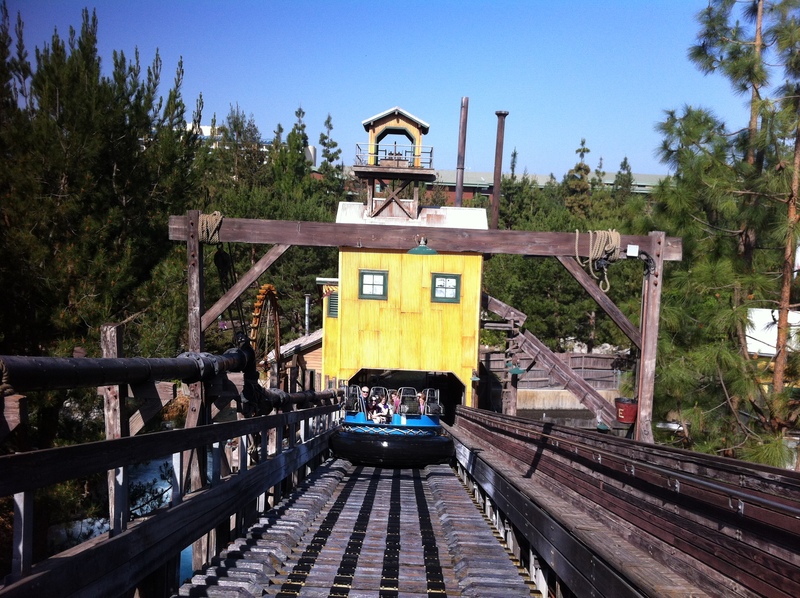 Having secured our afternoon and evening at Disney’s California Adventure, it was time for our first ride and since we were standing next to the 110-foot Grizzly Peak, it was an obvious choice. 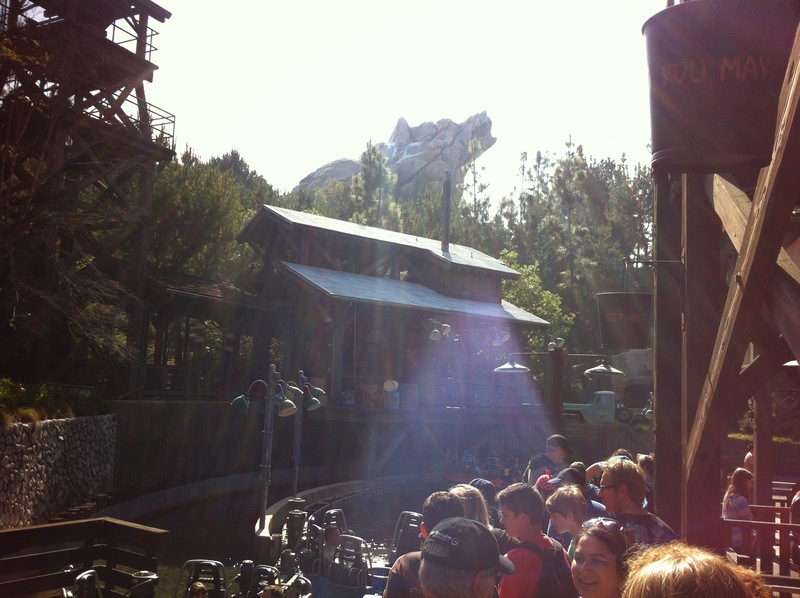 Our first ride would be Grizzly River Run, the white-water rafting adventure at the mountain’s base. Being early in the day, and a bit cool still, meant that we wouldn’t be waiting in line for very long. After a mere 10 minutes we found our selves strapped into the giant rubber rafting tube, slowing ascending the rickety conveyor belt, wondering who would get soaked first. I came away from the ride only a little wet, Andrea got it worse than me, but one of the other guys on our raft was almost completely soaked. It was a lot of fun. Then it was back to DCA for our chance to race one of the cars from Cars. 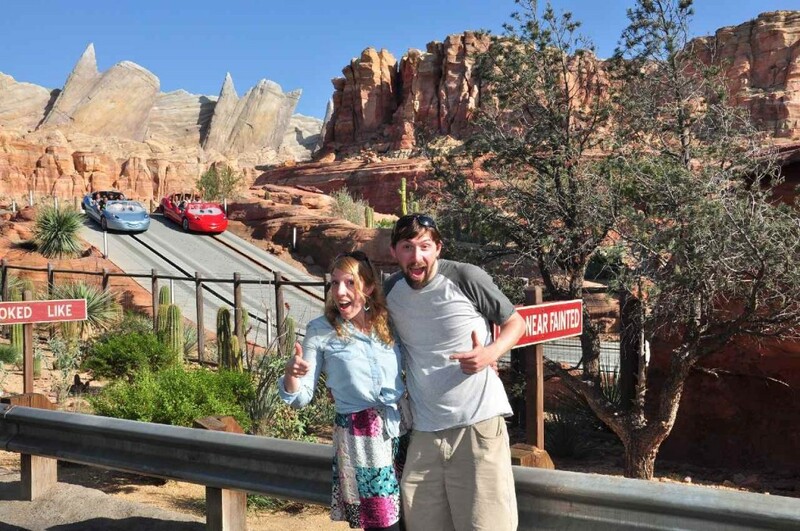 Cars from Radiator Springs Racers zoom by in the background. Probably my favorite ride of the day was California Screamin. Here’s the video. The last ride of the night was Space Mountain and then it was a well deserved rest back at the hotel so we can do it all over again tomorrow. It’s been over ten years since the last time I set foot in Disneyland, and I’m so excited about my trip next week that I can barely contain myself. Disneyland won’t be the only place we’ll visit but it’s certainly the one I’m most excited about. I’ve been researching which days will be the busiest (they will all be equally busy), which rides to rush in and get fast passes for (the new Radiator Springs ride tops my list), and even which route we’ll drive when we get up early next week (it’s still up in the air between the California 91 Express and the 60) I guess I will decide based on that morning’s traffic report. Here’s an animated gif of fireworks from the last time I was there. Back then, the closest thing my camera had to video capabilities was burst fire mode. The Disneyland Resort Paris music site is offering used to offerÂ free downloads of music from the park. The songs are available for two weeks and then rotated. Remember that youâ€™ll have to unzip the files and enter the password they give you (www.dlrpmusic.com) but the downloads are free. You can also find more downloads in the bonus section. Oh, and a word of warning, they have background music that plays automatically, ala webdesign 1996, but at least there is a stop button to turn it off. Disney to Build Third Park in Anaheim? Rumours abound that Disney is buying up property to build another theme park next to Disneyland. It seems more likely the company just wants to build more hotels, but if they did build another park… I would love it! 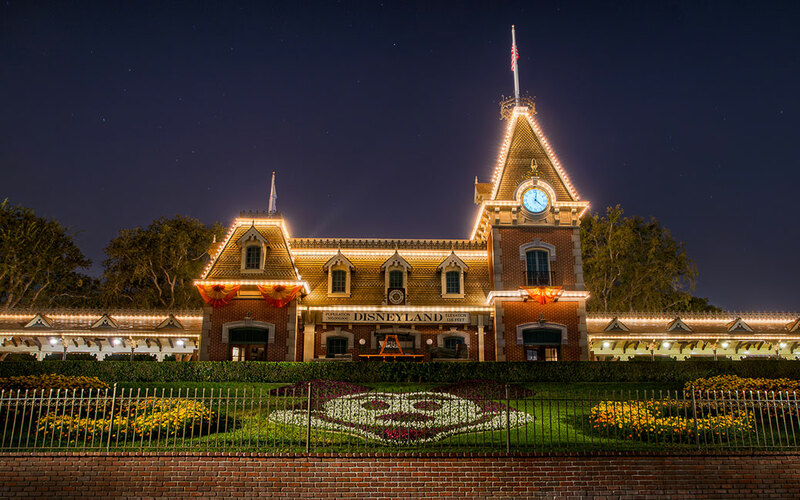 The [Disney] company has slowly but steadily amassed 460 acres in Anaheim, including a prime chunk of strawberry fields down Harbor Boulevard from Disneyland that is the designated site of a third park. And someone is approaching the field’s neighboring landowners, trying to buy up land. Corona del Mar resident Benjamin Kraut, 81, said Disney offered to buy his 5 acres several years ago. Then, six months ago, a suitor Kraut declined to name offered him $14.5 million for the land where he co-owns a 90-unit apartment complex. He said it is not for sale. Disney hasn’t unveiled plans for the Disney Resort—those typically come amid fanfare and orchestration&8212;but top executives have hinted at expanding existing markets and increasing its time-share offerings. 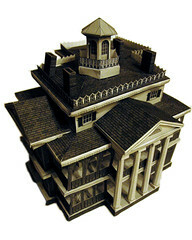 Last summer, Ray Keim of Haunted Dimensions released an extremely cool paper model of the Disneyland Haunted Mansion in New Orleans Square. My brother and I started working on it as a summer project, but since he was only here for one afternoon, we didn’t get very far. Lately he’s been back visiting and it got me back working on it again. Today, it’s finally finished and it looks great! There is a mother that is suing a Walt Disney World worker accused of groping her 13-year-old daughter while dressed as Tigger. I asked Anna-Maria what she thought about the possibility it was an accident since she has actually tried on some of the Disney costumes. She says that, “[While wearing the costume] your vision is greatly, greatly reduced. Furthermore, the suit is not just one layer. You have, generally, an under layer of padding followed up by a fur costume with large mittens on your hands that are often three times your regular hand size. I tried out many costumes. One was a cat costume, the cat from Pinochio and the sleeves go almost all the way to the ground on them so your hands are covered. Your feet are the same, you have shoes on followed up with a big fur boot, or depending on the costume a giant rubber shoe or boot. Also it’s so hot in there you don’t function properly. You’re biggest concern is getting enough oxygen. Definitely not groping someone — although I could be wrong. But I don’t think you could even think about that in that costume. It’s like a pure mental exercise just to stand wearing the costume. If it was one of the face characters, Santa Claus, Aladdin I could see it. But those other costumes are just unbearable. Oh and about a second after publishing this post I discovered this. It turns out he was acquitted earlier today. The acquittal came less than an hour following a three-day trial during which the defense attorney for Michael Chartrand donned a Tigger costume in an effort to show jurors how difficult it is to maneuver and see in the outfit. Chartrand’s defense attorney has contended that the girl’s mother was merely after money and planned to sue Disney. The mother also claimed Tigger touched her breast during the visit to Disney World last February, although no criminal charges followed her allegation. After deciding to actually go on this crazy trip the day had finally arrived (finally as in it had been almost 3 days since we got the tickets). I was planning to work both my life guarding job and then do 3 hours at the phone survey place. Well as luck would have it Anna-Maria talked me into phoning and getting the whole evening off so that we could just leave and get to Calgary. It was a good thing because it took me about an hour to get everything done I needed to, plus we ran over to Anna’s and then back to pickup some last minute laundry at my house. It was 9:30 by the time we arrived at Wally’s house. We ran out and got some food for Friday and Saturday from the nearby Safeway. Helga set the alarm clock for us and we hit the hay. I guess somehow the alarm clock was set half hour fast and at 3:30AM the annoying sound of an alarm clock went off, (actually it went on. To say that it went off would be lying. It was definitely on.) Anyway Wally was so kind as to drive us to the airport a little after 4:00AM as planned and then we were really off. 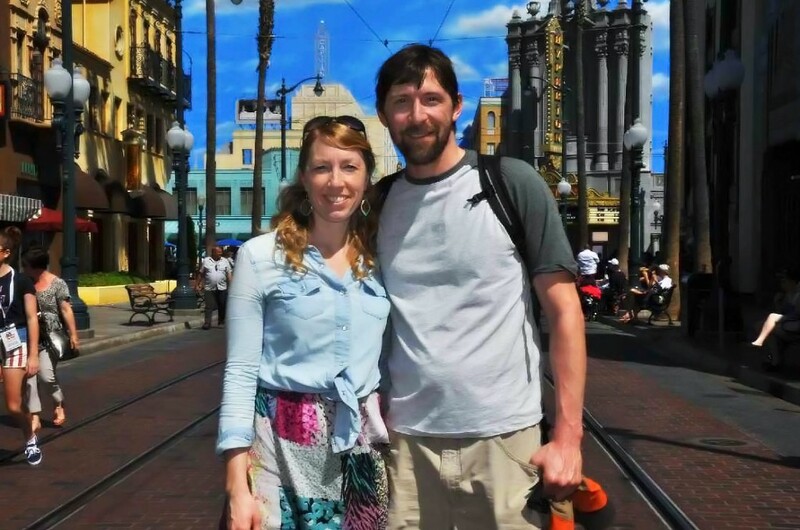 After a quick layover in Seattle we arrived in sunny California and the fun began. Hitching a ride on the Disneyland Shuttle it didn’t take more than 45 minutes to be in the park. We bought our tickets and entered the happiest place on earth. It still gives me tingles just thinking about it. We did so much that day, it’s hard to remember all the places we went. Toon-Town to Roger Rabbit’s ride, bought some cotton candy, Splash Mountain, oh and we even went over and checked into our hotel. It was so much fun! Then evening we went into the Haunted Mansion and saw the truly spectactular show, Fantastica! It’s a laser/light/fireworks/live actor/animitronic masterpeice that takes place on Tom Sawyer Island and the Rivers of America. Truly an amazing site to see. We got up early, went and had our complimentary hot breakfast in the train car restaurant next door to our hotel, and then walked over to the Disney Cast Building. I don’t know how nervous Anna was – I know I was nervous for her. I didn’t want to tell her I was nervous for fear that I might throw her off. She however seemed cool as a cucumber. The way the audition works was that everyone was assigned a number, and if when it came time for them to make cuts they read off numbers. If your number was called, that meant you were being cut. She said the highest number she noticed was 139. I left her to audition and hit Disneyland and California Adventure on my own. I remember as a kid, some of my fondest memories of Disneyland were from Tom Sawyer Island. I decided, well I’ll check out the old island and just see what’s over there. On the trip over I saw the character Tom Sawyer chatting it up with some of the other park guests, so when we arrived I followed him and he showed us around the Island. He showed us where Injuin Joe’s Spirit was trapped in a cave and what to do if we see him. He took us to his stash of pirate treasure that he and Huck Finn stole from Captain Hook’s own ship. Apparently Captain Hook has been circling the Island ever since trying to get his treasure back. Tom also took us through his caves up to a lookout fortress where we played “Fox and Rabbits”. It seemed a lot like hid and go seek, but a lot more fun since I was bigger than all the other kids playing. Actually I was on pretty even ground with them in my sandals, plus I wasn’t trying my hardest – didn’t want to look like a psycho. We stopped by the old graveyard, and up into Tom and Huck’s tree house where I learned their secret handshake. We also went down fishing – well attempted to fish, but they didn’t catch anything. They just didn’t have a clue as to how to catch fish. They figured it must have been some bad luck from “signing their names in all them people’s books”. Park guests would come up to them asking for autographs. Later that day I checked up on Anna-Maria and we went to Taco Bell to get her some supper. She was doing great in her audition and she gave me all the details of her day so far. She had to go back for another couple of hours during which time I went and took in the X-Games at California Adventure. Anna and I got our free breakfast again this morning and then headed to Disneyland to get in as much fun as we could before her 2:00 call back. 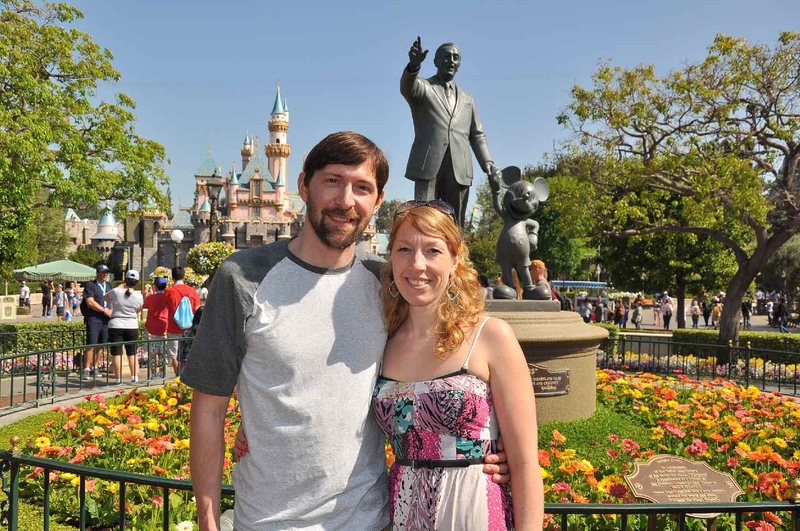 We rode the matterhorn, Splash mountain, and California Screamin’ (the sweet rollercoaster they have in California Adventure) as well as the Jungle Cruise and Tarzans Treehouse. I can’t remember all the places we went, but we did a lot. We saw Muppets 3D and the Bug’s Life 3D movie as well. There was the Sword in the Stone Ceremony, not to mention watching all the parades and fireworks that evening. There were so many things we did that day. Anna went back and finished her call back and was offered the job. Whether she takes or not, well I’m not sure what she is going to do. Anyway we hooked up with cousin JP after the fireworks were over and he took us to his place in Fullerton. It’s a really cool place – I especially love the fact that they have an outdoor pool that their landlord maintains for them. John Paul took us to Hollywood Blvd. where we checked out the Mann’s Chinese Theatre and the Hollywood Walk of Fame. We saw the cement handprints of famous actors from the last century and then took in lunch at Mel’s Diner. What a great day it was. Then it was off to the airport where we flew back to Calgary and slept another night at Wally’s. This time I set the alarm clock myself. If anything this trip was not only a not a waste of money, it has been quite possibly the best trip I’ve ever been on. 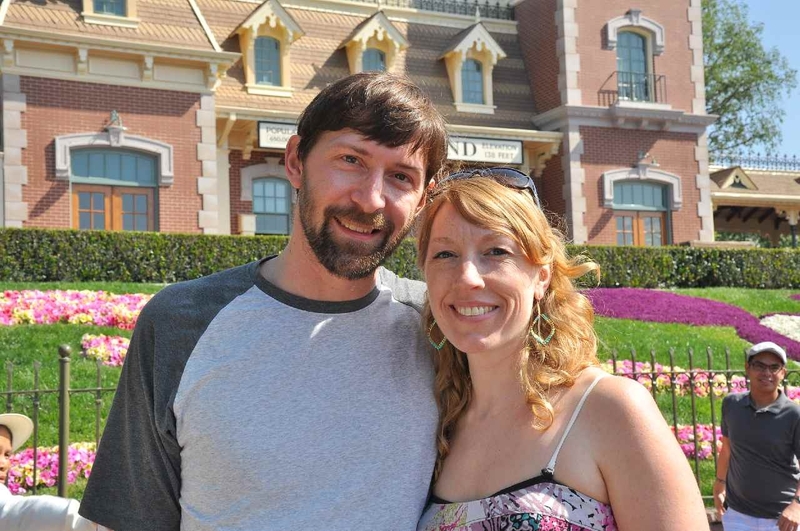 Disneyland really is the happiest place on earth. If you don’t believe me, then go check it out yourself, you won’t regret it. Anna-Maria and I are strongly considering going to Edmonton on the 28th of March to audition for a job at Disneyland. I would have to get a working visa first though and I am not sure if that will be possible, given the short amount of time I have to do it. It would be really cool to work at Disneyland though. I’ll keep you updated. Update: We never we to Edmonton for an audition but we did end up flying down to Anaheim where Anna auditioned and got offered a job at Disneyland. 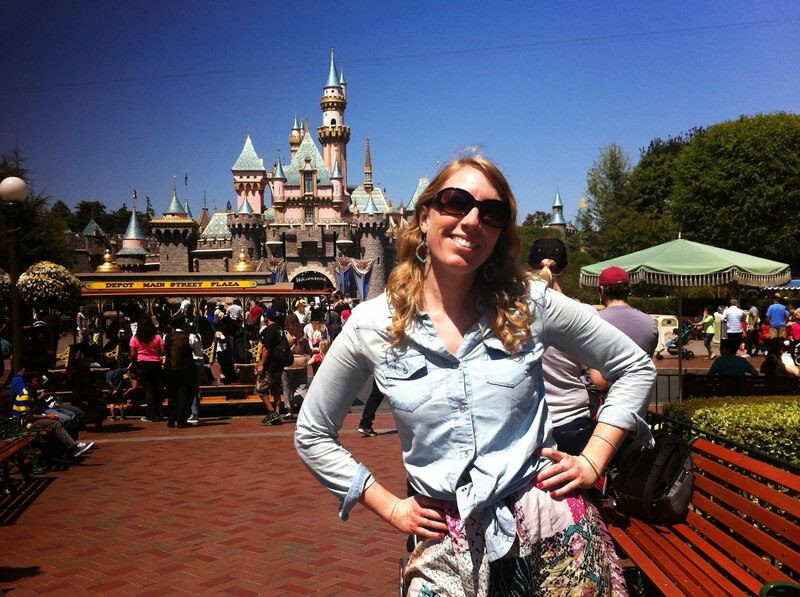 Also of interest — Anna tells in detail what it’s like to wear a Disneyland costume.